Cats are, without a doubt, amusing to watch – and even more amusing to observe in a partially filled theater of 75% octogenarians, 20% wholesome families, and 5% college-student-not-yet-killed-by-curiosity. The 2019 reel for the annual CatVideoFest encapsulated this entertainment quality unique to cats quite accurately – as lofty as they are, their antics warm the heart and soul. Cats have always had a mysterious pull on the internet and its users; from live stars like Grumpy Cat to cartoon favorites Pusheen and Nyan Cat, our feline friends have been subject to relentless meme-ing, viral videography, and all-around internet-ing. Yet a psychological reason for our obsession with these whiskery creatures as internet sensations remains unclear; some hypothesize that cats exquisitely mirror human behavior and tap into deeper perceptions of human emotion, while others think it as a result of our inclination to procrastinate with feel-good activities. Regardless of the true science behind cats’ internet popularity, the curators of the 2019 CatVidFest reel effectively harnessed all of the distinct qualities of addictive cat GIFs, videos, and animations. Going into the experience with more than my fair share of paw-slapping cat videos, I had a general expectation of what was to ensue on screen. What I did not expect was the audience’s high responsiveness to anything and everything the cats, both large and domestic, did on screen – with every twitch of the ear and shake of the tail, my fellow cat-lovers roared in hilarity, cooed with empathy, or buzzed with anticipation of the next clip. Needless to say, the majority of viewers were silver-haired, yet a surprisingly substantial number of young families attended. Every 6 minutes or so a tiny chorus of manmade meows would erupt from different sections of the theater, which I interpreted as proof of the bewitching hold that cat videos have on the average citizen. My favorite clip had to be the little gem strategically shown within the first five minutes of the reel; it hooked me in and set the bar for the later lighthearted, comical videos. The brilliant 41 second nugget portrayed a fluffy-cheeked, domesticated orange tabby in its true form: a predatory bounty hunter. I watched in quiet suspense as the great orange 13 pound beast stared down the slinkily approaching young black bear, as if daring the young contender to intrude further onto the tabby’s turf. Its orange and cream tail swished dangerously for four counts, back arched and prickly, ready to pounce. The naive little Ursus americanus failed to get the memo; as the outraged Felis catus shot forward in one elegant leap, its cowardly prey hightailed it up the nearest tree in an almost feline manner, only daring to slowly inch back down to its natural elevation and habitat once Felis catus was well out of sight. Though the tabby’s bravado elicited a hearty wave of laughter, it was accompanied by a plethora of other heartwarming and inspiring videos about cats and how they function as healers in our everyday lives. 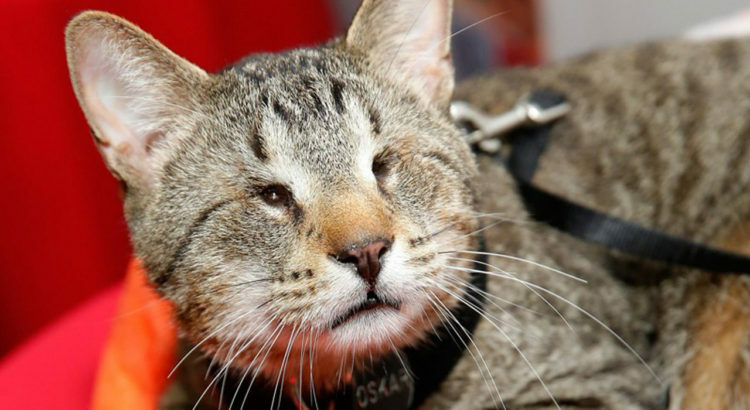 Oskar the Blind Cat is a prime example of this – though his recent death was a tragedy for the community, he will forever be known to inspire the blind with his iconic and energetic will to live life to its fullest. Another video followed the story of an abandoned kitten who finds its way into a computer guy’s car engine, and later, his heart. CatVideoFest is far more than a celebration of the ingenuity of various cat videos on the internet – like the organizations that it benefits, it interweaves stories of how cats have strengthened our very own interpersonal connections, bringing harmony as well as endless joy to communities who cherish them. Shannon is an overly hopeful freshman studying Art and Design and something else totally unrelated. She willingly spends copious amounts of her time and energy stalking Scottish Fold and Munchkin cats on various social media platforms. Being a cat lover I enjoyed this review. Meanwhile it’s good effort to raise money for cats in need. Unfortunately, We don’t have such ways in Asia.